Was following a little of this story that popped up within the last couple of days regarding a new online poker site, suddenly appearing and available to U.S. players in all states -- i.e., rogue, not regulated -- and awkwardly-named Superwins. Kind of a minor blip on the poker radar, this, but somewhat humorous given the apparently obvious connections between the new site and the fraudulent Lock Poker site from which the great majority of players have not been able to cash out their funds for many months now, more than a year in some cases. The new site shares all of the same promotional jibber-jabber, conditions, bonus offers, and apparently the software is similar, too. And as was quickly sorted out in the forums and by others, the site’s domain is registered to Lock’s CEO, and some inquiries have apparently uncovered that the two sites share a player pool to some extent, making Superwins a “skin” (more or less). 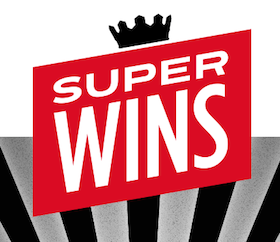 It appears a fairly transparent Plan B (or F or G or whatever) by Lock to drum up some capital, although the fact that the word on Superwins has gotten out so quickly would seem to have prevented the site from ever gaining any momentum in that direction. Sure, there will be some uninformed suckers depositing on Superwins, but I think we’re well past the days that a new “U.S.-facing site” (as we would call ’em) can make much if any splash. You can read a rundown and some commentary on the shenanigans over at Flushdraw. The part of the story that was most silly to me -- and also notable to Haley Hintze who authored the Flushdraw piece -- was the lame ad/review for Superwins on the Poker News Boy website where the new room is being promoted with surprising vigor. That PNB rates the new room 9/10 is funny enough, although we must compare their 10/10 rating for Lock Poker for some idea of the fantasies perpetrated over there (and note as Haley does how PNB is owned by a Lock affiliate manager). The review’s odd syntax, sentence fragments, and breathless tone add further grins. In fact, the more I look at it, the more every detail seems as though it could possess dual meaning, from the “big ambitions” of the site to its list of “popular methods” for depositing. Like a postmodern palimpsest with “straight” significances and built-in parody overlapped right on top of each other. It wasn’t that long ago, though, that we were paying a lot more attention to new sites like this. Just after Black Friday they caught the eye of many, and some (like Lock, in fact) successfully attracted business. And before that there were dozens, some suspect, many appearing legit. I guess it is the (increasingly dim) memory of those ads and that earlier era when the context for them was different -- and knowing that context is no more -- that makes looking at this new site and those trying to promote it as all the more risible.